In the strange case of Lake Murray's disappearing (and reappearing) purple martins, many questions remain. At popular Lake Murray in the Midlands of South Carolina, the great purple martin mystery of the summer of 2014 turned into the puzzle of the summer of 2015, leading to intrigue as the summer of 2016 approaches. Where will this vast flock of purple martins in the middle of South Carolina decide to roost this time around? The betting money is on Lake Murray's Bomb Island, where they flocked by the hundreds of thousands for more than a quarter century beginning in the late 1980s. 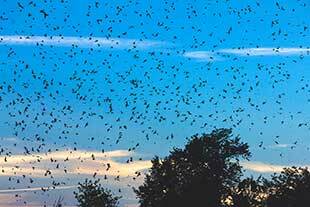 Experts have declared it one of the largest purple martin roosts in the country. But the birds deserted Bomb Island in 2014 and instead roosted on an unnamed island twenty-five miles away at Lake Monticello in nearby Fairfield County. 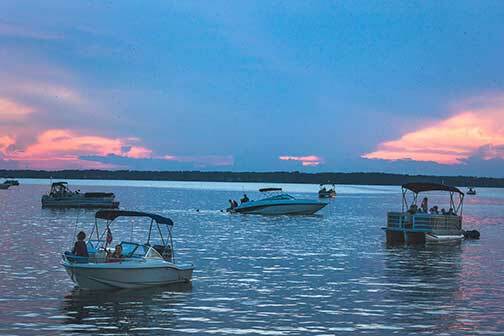 The move disappointed the sunset boaters who flocked to Bomb Island each night from early July until late August. They missed the amazing show the birds put on as they return from their daily insect-devouring excursions throughout the Midlands, circling the roost island like fast-moving clouds for fifteen to thirty exhilarating minutes. After a one-year absence, however, the little birds inexplicably returned to Bomb Island in 2015. Lake Murray boaters rejoiced, but, now they wonder, if the martins left once, could they do it again? Sure they could, but will they? Wildlife experts know better than to predict the annual migratory, nesting or roosting changes of birds. Amy Tegeler arrived in Columbia as coordinator of the Bird Conservation project for the S.C. Department of Natural Resources about the same time the purple martins skipped town in 2014. As the summer of 2015 neared, she said, "people were asking me if the purple martins were coming back, and I had to say, 'I'm afraid we just don't know.' "
Tegeler didn't want to raise hopes, because frankly, the odds were against a return. "I'm a little surprised they came back," said Tegeler. "Once they're gone, they don't usually come back." But this time they did, and they might come back again this summer. Or they might not. Purple martins, members of the swallow family with fifteen-inch wingspans, feature coloring so dark blue they seem black in the sky. They leave their group roosts in North America late each summer for the arduous journey to their South American winter homes. Then in spring, they return, not to the group roosts, but instead to much smaller nesting colonies of a few dozen birds each. 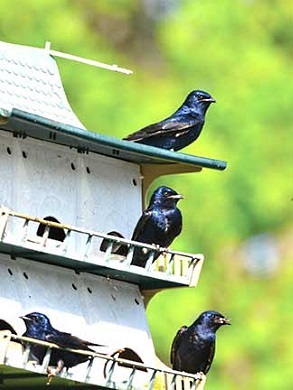 Purple martins are cavity nesters, but, on the East Coast at least, the birds are heavily dependant on human assistance for finding suitable nesting sites. Thousands of martin lovers in South Carolina carefully prepare and mount martin houses (traditionally fashioned from hollow gourds) that are designed to attract nesting birds in the spring. Not only are the birds fun to watch as they return to the nests each night, but they also devour mosquitos in the area around their nests. 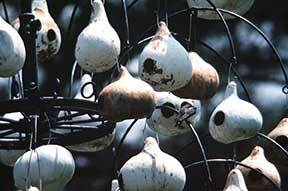 Some bird lovers have hung gourds in their yards for years, never to attract a martin. Others draw dozens of the birds the first time they put one up. At one of those successful gourd colonies in Sumter County, Julie Hovis, an endangered species biologist at Shaw Air Force Base, and purple martin enthusiast Jim Beatson have spent spring and early summer evenings the past few years catching martins in long-handled nets as they enter their gourd nests for the night. Some of the birds are banded, others get bands plus tiny tracking devices attached to their backs before being returned to their nests. Their effort is part of a major research project aimed at getting a better handle on the species' migratory route. The birds tend to return to the same nesting sites each year, and Hovis and Beatson have recaptured several birds with geolocators strapped on them a year later. The data from those and others in the project indicate these little birds can cover several hundred miles in a day. Some of the birds with geolocators have made the journey to Mexico in two days, Hovis said. They might stay around to rest and feed for a few days, then zip the rest of the trip to Brazil in just a couple more days. The trip back each spring is quick, too. 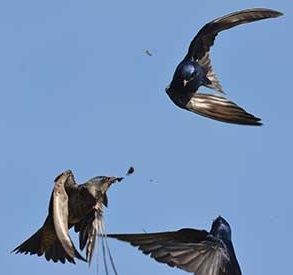 Purple martin enthusiasts - just go online to the forums on purplemartin.org for an idea of the depth of their enthusiasm - wait impatiently each spring for what many consider the first nest-scouting birds. Hovis suspects those might be early arrivals who are heading farther north, but many enthusiasts claim the scout birds somehow let later arriving birds know of gourd complexes that meet their standards. Martin landlords say the larger group of birds then returns nearly the same day every year. A similar species prompted the saying "like the swallows to Capistrano" to indicate something is predictably timely. Those cliff swallows for decades legendarily returned to the Mission San Juan Capistrano in California on St. Joseph's Day (March 19) and left on the Day of San Juan (October 23). Then in the late 1990s, their numbers at the mission dropped precipitously, casting a pallor over the annual tourism celebrations associated with the birds' comings and goings. Officials in San Juan Capistrano in 2010 turned to swallow expert Charles Brown of the University of Tulsa for advice. Brown says the problem likely is related to construction workers destroying long-standing mud nests while making renovations to the two-hundred-year-old mission's walls. But he can point to other suspects as well, particularly urbanization that replaced old native trees with new non-native species. Brown suggested playing recorded swallow calls and building man-made nests to draw back the swallows. The efforts have been minimally successful. Told of the Lake Murray situation, Brown was surprised the birds returned to Bomb Island. He knows from experience; it's hard to get swallows to come back once they've left. In South Carolina, purple martins spend about three months in their small nesting colonies spread throughout the state mating, laying eggs and caring for young birds in the gourd nests until they are ready to fledge. Then, in early July, the birds from the small colonies begin to gather each night in communal roosts. These roost colonies are so large in numbers they have shown up as donut-shaped clouds on weather radar when the birds leave each morning. Rings have appeared on the radar each late-summer morning in recent years over northern Lake Moultrie, over Lake Russell and over the Savannah National Wildlife Refuge. By far the largest, however, was over Lake Murray. Except for 2014, of course, when the radar ring was the first indication the birds had moved to Lake Monticello. So what did Lake Murray officials do to lure the birds back to their roost? The short answer is nothing. Some locals had speculated the annual July Fourth fireworks display launched from nearby islands played a role in scaring away the birds in 2014. But the fireworks had been a tradition for years without seeming to bother the birds. During their one-year hiatus on Lake Monticello, thousands upon thousands of the birds would stop at what Julie Hovis calls a "last-minute staging area" each night - on the high-power lines running to the V.C. Summer Nuclear Power Plant. But a spokesman with SCE&G, which manages the plant, said the power company did nothing to discourage the birds from returning in 2015. 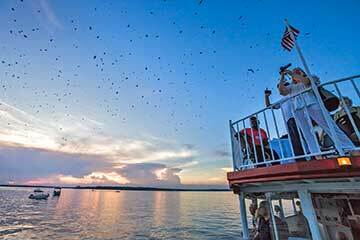 For their part, Lake Murray tourism officials are just glad the birds returned. Their one-year absence brought the kind of publicity that can't be bought, according to Miriam Atria, president and CEO of Capital City/Lake Murray Country. 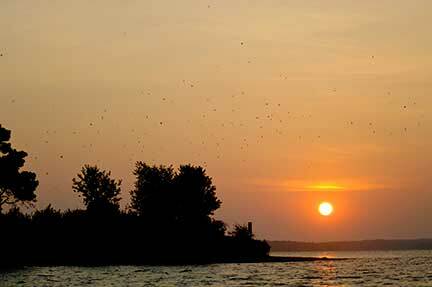 National media outlets ran stories about the birds featuring gorgeous shots of sunsets on the lake, and Atria said out-of-state visitors have cited those scenes for drawing them to visit the area. Tour boat bookings increased last summer after the publicity, especially when it became clear the birds had returned. "Personally, I observed over 135 boats at one time taking in this experience," Atria said. "I hope the purple martins continue their visit to Lake Murray as this phenomenon provides our area with something we can promote as an attraction of the four-county region." The DNR, which patrols Lake Murray and protects Bomb Island as a purple martin sanctuary in the summer, didn't do anything to change the habitat on the island to lure back the birds. Tegeler and other experts from the agency toured the island in 2014 looking for problems and didn't notice any major changes in the trees or understory plants. And when Tegeler went back in 2015, after the birds returned, she didn't notice any major differences in the habitat then either. During the inspection of the island in 2014, DNR officials did note evidence that people had been camping on the island in recent weeks. Maybe campers spooked the early arriving martins, goes one theory, but the birds nest near people all the time in other parts of the country. Maybe answers can be found along the state's coast. Shorebirds that nest and roost in large numbers often pick up and leave after several years in one spot. "That's the norm with birds that nest in large numbers along the coast," DNR biologist Felicia Sanders said. "Birds rarely stick to the same place year-after-year because you attract predators that way." The DNR has gone to great lengths to make several small islands welcoming for shorebirds, including mounting special cameras to watch for predators. When a colony practically abandoned the Bird Key Stono Seabird Sanctuary in recent years, biologists checked the camera footage. "There was a great horned owl picking them off," Sanders said. Birds on the lookout for owls and other predators don't feel safe enough to nest or roost, Sanders said. At Bird Key Stono, the owl apparently moved on last year, because the 2015 nesting season there was a rousing success. Up on Lake Murray, the DNR team inspecting Bomb Island in 2014 also flushed a great horned owl, but suspected he wasn't a factor, since none of the island's trees had the whitewash large owls typically leave on the trunks if they stay in one location for a long time. Tegeler also is reluctant to point to that owl as a primary suspect in the mystery of the fleeing martins. More likely, she said, it was a combination of natural predators and human disturbance. Or maybe the birds just wanted new scenery. "There's probably a hierarchy within roosts, with decision-makers heading out first to preferred spots," she said. In 2014, the decision-makers either got spooked at Bomb Island or were looking for a change of pace. Could it happen again in 2016? Could the birds even head back to the island in Lake Monticello? "I would not be stunned (if they return to Lake Monticello) because they already went there once and stayed all season," Tegeler said. "But I think something would have to happen for them to move again." 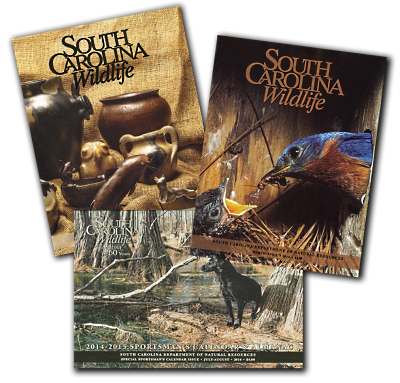 Former State newspaper reporter and freelance writer Joey Holleman was recently named science writer and editor for the South Carolina Sea Grant Consortium, www.scseagrant.org.